This heavy duty cover is 100% water proof with vents in the roofline to help damp & moisture to escape. Features double stitching for strength, non-scratch latest generation material in a silver colour and is elasticated front and rear. 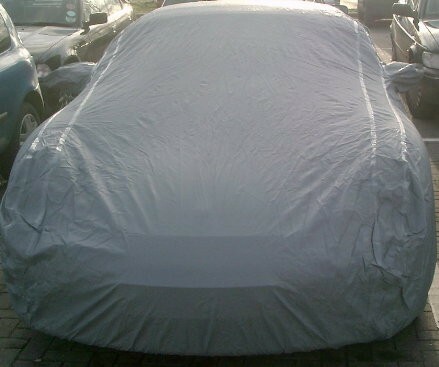 The fabric is 100% UV resistant and protects against rain, frost, snow, birds, tree sap, sunlight, dirt & dust. 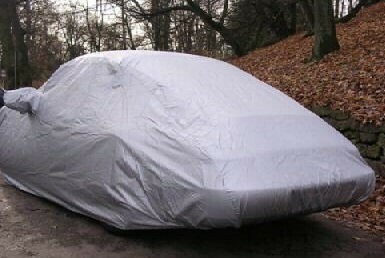 Supplied in a strong zipped storage bag, this cover takes up very little space and can be tucked away easily when not in use. .
Sturdy detachable underbody straps are provided, so however stormy the weather, you know your car is secure & protected from the elements. . Simply select your type of Porsche from the drop down box below and we'll provide a specific tailored cover for that type and age of car. Our extensive range of Porsche fitted and tailored patterns are now available in 4 Layer Stormforce Material, which received rave reviews in GT Purely Porsche Magazine. The Monsoon Winter Cover is ideally suited for use in temperatures below 70f / 21c. 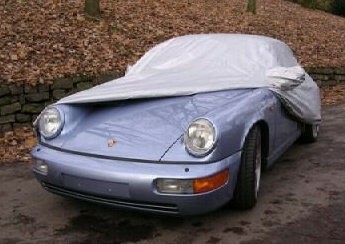 If you require an all year round cover, we suggest that Stormforce Upgrade will be a better option.